The world has barely begun to exploit the massive energy potential of waves. SINN Power from Munich wants to change this with a modular and cost-effective wave energy converter. The system has passed the initial tests with flying colours, thanks in part to connection solutions from LAPP. Sometimes, the best ideas come when you least expect them. Philipp Sinn went on a sailing trip to get away from the stress of his job as a consultant in the automotive industry. As the waves crashed around him, his mind turned to the huge amounts of energy that they must contain. Back home, he designed a cost-effective way to turn this energy into electricity without the need for complex technology. This idea turned into a PhD thesis that went on to form the basis for the company SINN Power, founded in 2014. Today, the company is based in the same house where Sinn once lived in Gauting near Munich. It employs ten people who all work on the future of energy supply, along with up to 15 students who bring fresh insights from their studies. “They are an important pillar of our company”, explains Sinn. The basement is home to the tinkerers and inventors. This is where the metal components, PCBs, generators, measuring equipment and cables are combined to form modules. These are then combined via a lightweight connection mechanism to form larger floating arrays. 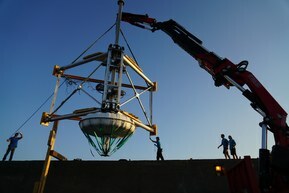 Each module features a disc-like float at the bottom, measuring up to three metres in diameter, which rises and falls with the waves. This movement is then conveyed upwards by a ten-metre-long rod, which drives up to eight generators that turn the movement into electricity. The next stage of development will be to fit a synchronised gear that ensures that the generator always turns in the same direction, regardless of whether the rod is moving upwards or downwards. One disadvantage that many renewable energy sources share is that they are not capable of generating electricity consistently. Even the largest wind turbine is useless if the wind is not blowing, and cutting-edge photovoltaic units cannot generate electricity at night. Filling these gaps with clean energy requires an alternative. This is where wave power comes in. It is capable of covering the base load, i.e. providing electricity when other sources cannot. This kind of combination is a particularly interesting option for decentralised power generation, such as on an island. But the technology’s potential is much greater than this. SINN Power plans to install wave energy converters in the unused spaces between individual turbines in large offshore wind farms. Another option is to attach them to harbour walls like those in Heraklion. The first enquiries have come from Africa, a continent with many coastal communities and often poor power supply. 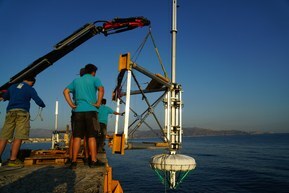 The Cape Verde islands gave SINN Power the opportunity to begin turning its wave power technology into a commercially viable solution. A project to power a shrimp farm using wave energy is due to be completed by 2021. SINN Power is also conducting a feasibility study in the Guinean port city of Conakry for a British and Israeli consortium. The ultimate aim is to build a wave power station to supply electricity to the local area. The initial measurements underline the benefits that a combined installation would offer here. During the rainy season between May and September, the energy density of the waves increases just as that of solar and wind energy is falling. Philipp Sinn is not the first person to have the idea of harnessing the power of the waves to generate electricity. The first experiments date back to the 18th century, although they ultimately proved to be too complex and expensive. So what makes SINN Power different? “Our modular design offers cost-effective scalability”, says Johannes Stuck. The company’s competitors build their systems in shipyards before towing them to where they are required. These usually consist of heavy components and are not scalable. Many of the world’s coastal regions lack the necessary infrastructure for these projects. By contrast, SINN Power constructs its modules directly on site. The system still requires authorisation from Hanseatic Lloyd, however, as it is considered an anchored ship from a legal perspective. Philipp Sinn is proud that in just three years, his company’s technology has overtaken that of all of its competitors to become market leader: “That’s despite the huge amounts they’ve invested over decades.” The central features of the design are now protected in a series of patents. LAPP already has experience of renewable energies from other projects, such as connection systems for solar power. In 2016, LAPP provided cabling for wind turbines with integrated pumped storage. Max Bögl Wind’s natural energy store in Gaildorf near Stuttgart is helping the energy revolution reach new heights. When there is excess wind energy, water from the valley is pumped up into the pumped storage. From here, it can compensate for periods of low wind with the help of three powerful turbines in the valley. LAPP provided the control cables, thick power cables and data cables for the wind turbines through just-in-time delivery at the construction site.